These tiny grains, known as cosmic dust, are similar to very fine soot or sand. However, in the outer regions around a brown dwarf — a star-like object, but one too small to shine brightly like a star — astronomers expected that grains could not grow because the discs were too sparse, and particles would be moving too fast to stick together after colliding. Also, prevailing theories say that any grains that manage to form should move quickly towards the central brown dwarf, disappearing from the outer parts of the disc where they could be detected. 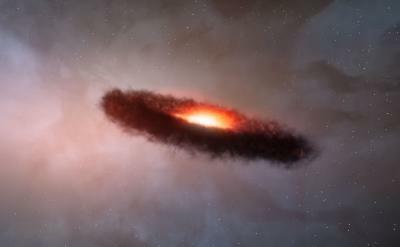 “ALMA is a powerful new tool for solving mysteries of planetary system formation,” commented Leonardo Testi from ESO, a member of the research team. “Trying this with previous generation telescopes would have needed almost a month of observing — impossibly long in practice. But, using just a quarter of ALMA’s final complement of antennas, we were able to do it in less than one hour!” he said.